Can You Convert DVD to Blu-ray Quality? A friend of mine has collected a pile of old DVDs and after watching HD quality videos from all kinds of online video sharing sites, he started to get unsatisfied with the quality of his DVD discs. So he asked me how to convert DVD to Blu-ray quality. Well, as nice as it sounds, it’s just physically impossible to convert DVD to Blu-ray quality. Videos stored in DVDs are at a resolution of 720*480 pixels in countries and regions like North America, South Korea and Japan or 720*576 pixels in most European countries, Australia and most of Asia, which we call standard definition. The standard definition video is encoded using MPEG-2 compression. 9.8 Mbps is the highest bitrate of a video in DVD and the average bitrate for most DVD videos are around 4-5 Mbps. Lower bitrate can cause problems like pixellation, image softness and other visual issues. 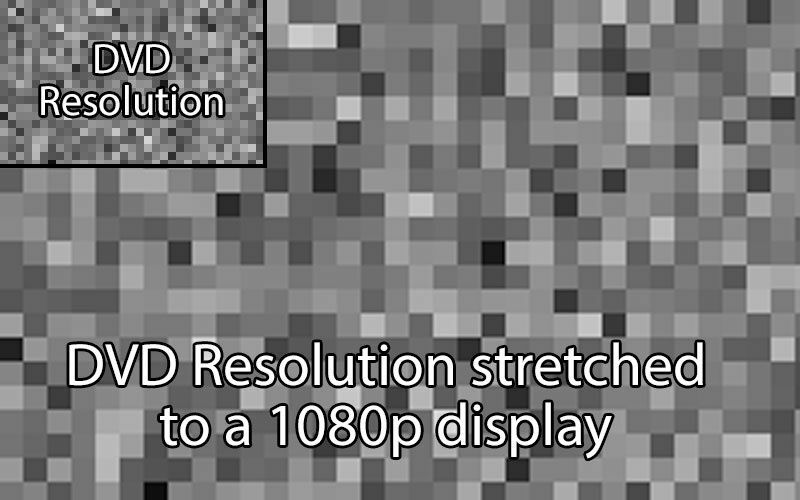 Blu-ray discs can hold videos of different resolutions. But most studios would choose to go for Full HD, which is 1920*1080 resolution. Most Blu-rays use VC-1 or MPEG-4 AVC video codecs for video compression. They are newer and more advanced and allow for better video quality at lower bitrates than the old MPEG-2. And the bitrate of most Blu-rays are much higher than DVDs. As you can see, Blu-ray is leaps and bounds ahead of DVD regarding quality. DVDs are highly compressed when they are made. While there are programs that would allow you to convert DVD to Blu-ray, there’s no way to undo the compression, at least not by converting DVD to Blu-ray. By doing so, you will probably end up with a DVD video in 480p resolution stretched to 1080p, which is blurry and unclear. If you insist in doing so, below is what program you can use and how to convert DVD to Blu-ray with it. Under certain circumstances, like when you want to back up and copy your DVD but you only have a blank or rewritable Blu-ray disc, you might need to convert DVD to Blu-ray. While you can’t convert DVD to Blu-ray quality, it’s still possible to just convert DVD to Blu-ray. There are programs that can help you do that. The best way to convert DVD to Blu-ray without lossing much quality is to rip the DVD to a lossless MKV video and then use a Blu-ray burner program to burn the MKV video to a Blu-ray disc. The programs you need include Leawo DVD Ripper and Leawo Blu-ray Creator. The Leawo DVD Ripper is one of the top DVD ripping programs out there which is capable of ripping DVDs to lossless MKV videos and a lot of other formats you can think of. 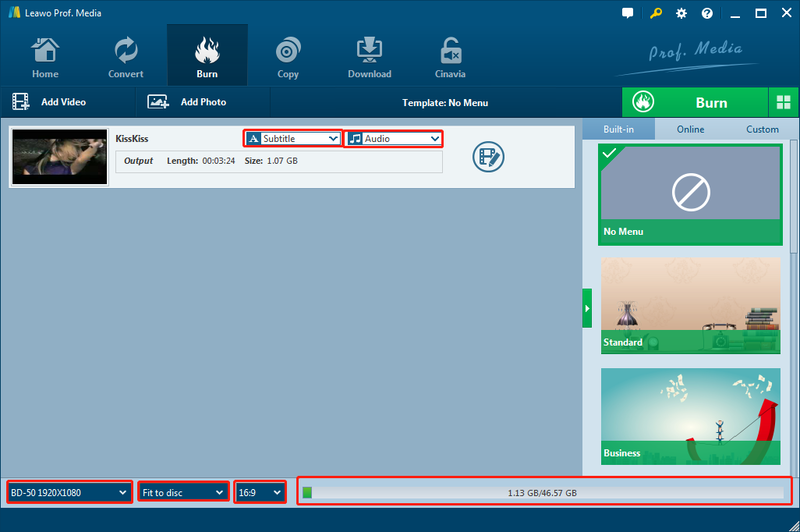 And the Leawo Blu-ray Creator is a powerful piece of Blu-ray burner software to help you burn all kinds of videos to Blu-ray discs. 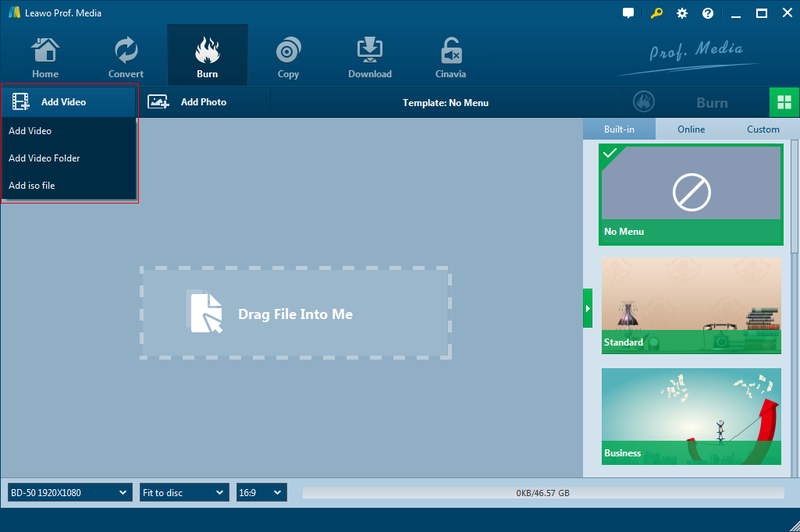 Below’s how to utilize the two programs to convert DVD to Blu-ray. Note that both programs are components of Leawo Prof.Media, the company’s all-in-one software suite. Step 1. Insert the DVD disc you want to convert to Blu-ray to your dis drive and launch Prof.Media by double-clicking the shortcut icon of the program on your desktop. And then hit the DVD Ripper tab on the interface to open the module. Step 2. If the disc is ready, you should be able to directly load all the content in the DVD to DVD Ripper by clicking Add Blu-ray/DVD>Add from CD-ROM>[your disc]. Step 3. If your disc contains multiple video titles, which is most of the time, you need to decide whether to keep all the titles or just some of them. You are offered 3 choices for choosing different titles to keep. Full Movie keeps all the titles, Main Movie only keeps the title with the longest duration. Main Movie can be used to manually choose the titles you need. Click OK to proceed to the next step by adding the chosen titles to the video list. Step 4. Click the button that is set to locate on the left of the green Convert button in the upper right and then click Change to head to the Profile panel. 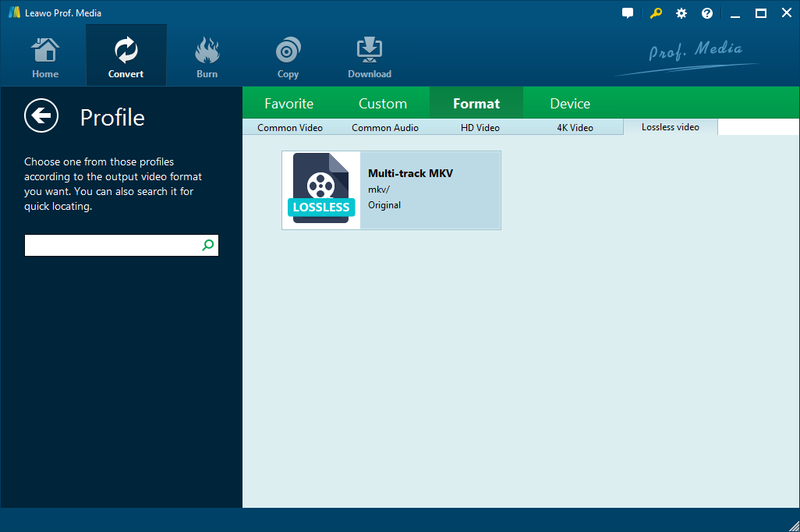 And then find the lossless MKV format in Format>Lossless video. There’s only one option on this page and it’s Multi-track MKV. This is the lossless MKV profile we need. Directly hit the tab with your mouse to set it as default. Step 5. Hit the green Convert button in the upper-right and wait for a sidebar to display from the right of the video list. On the sidebar, set the location of the output MKV video under Save to and then start converting the DVD to lossless MKV by clicking the Convert button at the bottom. 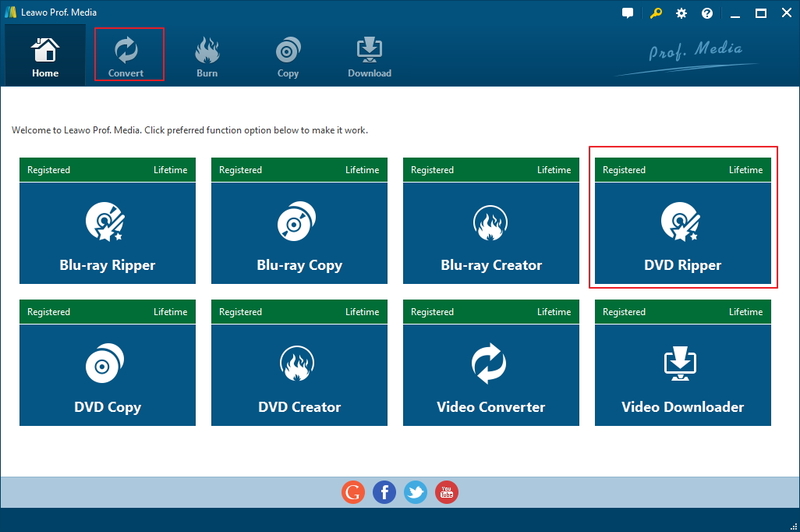 When you get the MKV video, You can use Leawo Blu-ray Creator to burn the MKV video to a Blu-ray disc or just directly convert the video to a Blu-ray folder or Blu-ray ISO image on your computer. Here’s how. Step 1. Click the Home button in the top-left corner to return to Prof.Media’s main interface and click Blu-ray Creator. Step 2. 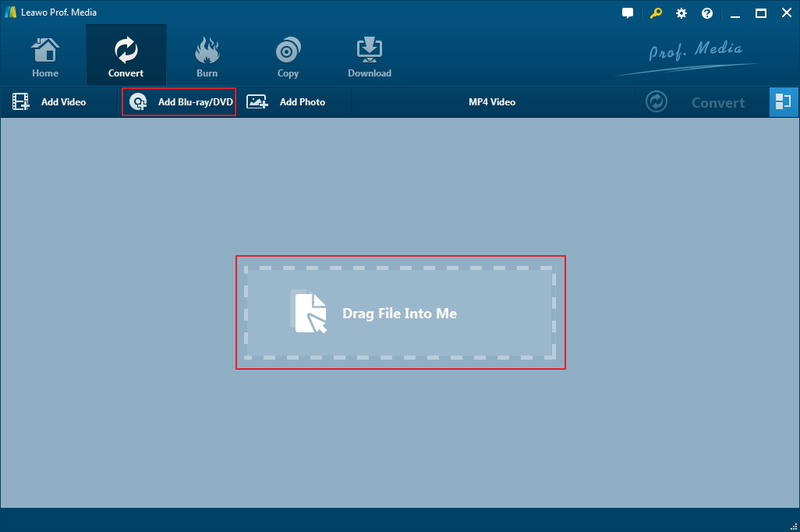 Directly drag the MKV video to the interface of Blu-ray Creator or use the Add Video button to add the MKV video to the module. Step 3. 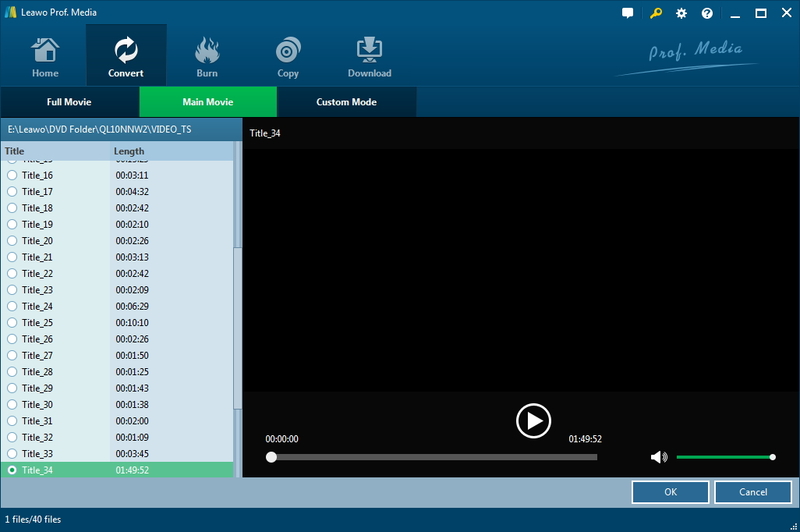 Click the Audio and Subtitle drop-down menu on the file to select the audio tracks and subtitles you need. Step 4. Click the Disc Format drop-down menu in the bottom-left and select a Blu-ray format from the menu. Step 5. Click the green Burn button in the upper-right and there will be a sidebar with more options. Under Burn to there are 3 options. The Folder and ISO File options can help you convert the MKV video to Blu-ray folder or Blu-ray ISO and save the files to your hard drive. If you choose one of the two options or both options, you need to set output path for them in the box under Save to. The third option is for you to burn the MKV video to a disc if you have a blank Blu-ray disc and a Blu-ray burner. Hit the Burn button at the bottom to start burning or converting the MKV file. That’s how to convert DVD to Blu-ray. While you can’t convert DVD to Blu-ray quality, you still have the chance to convert DVD to Blu-ray, although the quality won’t be as good. If you need, Leawo DVD Ripper can help you rip DVD to play on Apple TV or other handsets as it supports formats like MP4, WMV, AVI and more.